Rohit Sharma scored a quickfire 50 and also became the leading scorer in T-20 International, as India comfortably defeated New Zealand by seven wickets in the second T20I at Eden Park, Auckland to level the three-match series 1-1 on Friday. Both teams went into the game with an unchanged line up. After winning the toss and electing to bat first, Black Caps lost an early wicket in the form of Tim Seifert who was caught by Mahendra Singh Dhoni off Bhuvneshwar Kumar for 12. The pair of Colin Munro and skipper Kane Williamson steadied the ship and added 26 runs for the second wicket, before Krunal Pandya provided the breakthrough by getting the latter in the sixth over. The left arm all rounder claimed back to back wickets off Daryl Mitchell who was dismissed leg before wicket in controversial circumstances when the hot spot showed a clear inside edge onto the pads and Williamson to peg the home side back. However, Colin de Grandhomme and Ross Taylor took the attack to the Indian spinners by adding a valuable stand of 77 runs for the fifth wicket, before Hardik Pandya broke through by getting the 32 year old all rounder De Grandhome for a blistering knock of 50 off 28 balls. Taylor along with Mitchell Santner took the New Zealand score above 150 run mark before the former was run out by a brilliant throw by Vijay Shankar for a well made 42. Khaleel Ahmed who had a poor outing in the first T 20 came back with a bang by claiming the wickets of Santner and Tim Southee as Kiwis finished their innings at 158/8 in their allotted 20 overs. 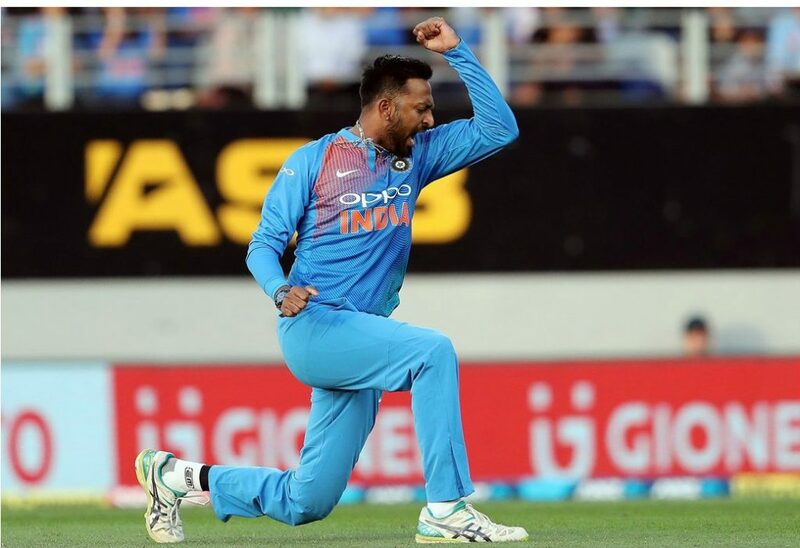 Krunal Pandya was India’s most successful bowler as he finished with figures of 3/28 in 4 overs, while Ahmed bagged 2 wickets. Chasing a modest target of 159 runs, the opening pair of Rohit Sharma and Shikhar Dhawan laid a solid foundation at the top by adding 79 runs for the opening stand, before the Mumbai Indians star fell to Ish Sodhi for a brilliant 50. In the process he also overtook Martin Guptil to became the top run getter in the format. His knock comprised of three fours and fours sixes. Lockie Ferguson got into the act by claiming the wicket of Dhawan for 30. Vijay Shankar and Rishabh Pant steadied by adding 30 runs for the third wicket, before the latter was dismissed caught by Southee off Mitchell leaving India at 118 for 3. Pant along with former Indian captain Dhoni saw the team through without further damage by adding an unbroken stand of 44 runs, as the visitors reached the target of 162 runs in 18.5 overs. The 27 year old left arm all rounder was declared the player of the match for his brilliant spell of bowling. The third and the final T-20 will be played at Hamilton on Sunday.